Have you ever stumbled upon the TLC show "The Look for Less"? I have...and loved it. I decided to embark on my own little "episode", and even adhere to the $100 price limit they are required to stay under on the show. 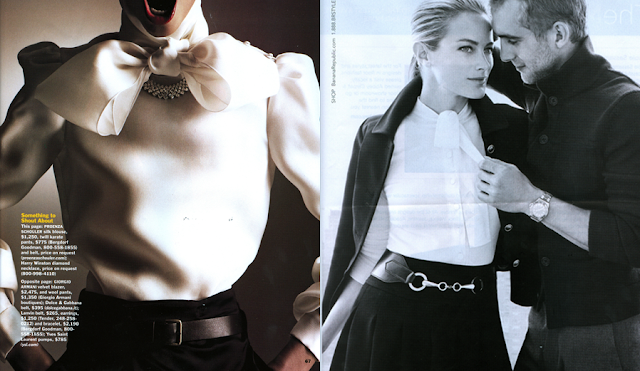 Recently, I found myself drawn to these two fashion spreads featuring pretty white blouses, pleated black skirts, and accentuated waists. I decided to use these two pages as my inspiration for this quest. Given that one of these tops is priced higher than a RT ticket to France (can you imagine? ), I could be biting off more than I can chew...but we'll see. oh i love that show. elizabeth hasselbeck was so fun to watch. is it still on? good luck in your quest. this is a VERY good idea. i'm excited to see what you come back with! Have you seen Ralph Lauren's "American Living" line at JC Penney? There's a dress that looks like a ruffled white top with a black skirt bottom. No pleats, but it's on sale for $66! Ooo, good idea! Can't wait to see what you find! Oh, and Leslie...I'm not sure if it still on. We don't have a tv anymore...but I would guess it is. It must've been popular...it's a great concept.